It is said the people of Brescia have petrol rather than blood flowing through their veins, having held their first motor races even before 1900. In March 1899 Ettore Bugatti won the Verona-Mantura-Brescia-Verona race in a Prinetti & Stucchi 3-wheeler but the Brescians were desperate to hold their own event and so in September 1899 organised their own 223km race and soon after prepared the 185Km “Brescian Raceway” connecting the northern cities of Brescia-Cremona-Mantua-Brescia. The success of these early races prompted the locals to set up their own automobile club under the control of the Milan Automobile Club. However, in 1926 the Brescians broke away from the Milan club following a national rule change to give them complete control of the Brescia Automobile Club. This allowed them to hold their own events at long last, and what an event they had in mind. The race was to cover a distance of 1000-miles from Brescia in the north of Italy down to Rome and back, through narrow, cobbled streets lined with crowds packed 10-deep as competitors pushed their machines to breaking point with little regard for their own safety or that of of the crowd. The aristocratic participants had only rudimentary maps and the now famous Freccia Rossa (Red Arrow) to navigate the challenging route. The first race began at 8am on 26th March 1927 and the winners Giuseppe Morandi and Ferdinando Minoja driving the celebrated O.M. 665 Superba crossed the finish line only 21 hours, 4 minutes and 48 seconds later. Driving 1000 miles in less than a day is a long slog by modern standards but this is with luxuries such as Bluetooth sound systems, sat-nav, leather seats, significantly larger fuel range, considerably better reliability, and not to mention the smooth, 100mph motorways. In 1927 no-one thought such a distance possible, competitors packed luggage, fully expecting to be on the (unpaved) road for several days, and indeed some cars were. The world’s press heralded the news, “that a new era of freedom hitherto unknown had arrived”. At first this sounds a touch dramatic but when you consider that airplanes existed primarily as rich men’s playthings, not as a serious means of transportation, being able to drive such a distance opened up a world of opportunities. The Mille Miglia ran 13 times before the war and 11 times more after 1947 before its demise in 1957. Heroic stories abound such as Tazio Nuvolari tailing his teammate Achille Varzi in the dark with his headlights off so Varzi would not know when Nuvolari was going to overtake and go on to win the 1930 Mille Miglia in an Alfa Romeo 8C. The peak of the race though has to be in 1955 when Stirling Moss, driving his Mercedes 300 SLR with race number 722 (for starting at 7:22am) won the race with a blisteringly fast average speed of 98mph, completing the 1000 miles in 10 hours, 7 minutes and 48 seconds. Moss’ achievement was incredible but by the mid 1950s the most beautiful race in the world had started to rack up a large human cost. Across the 30 years that the race was run the speed of the cars increased dramatically – remember that Moss’ average speed was double that of Morandi and Minoja’s in 1927. With such a fast rate of development, the competition amongst the manufacturers was fierce and drivers pushed even harder, all of it on roads open to the public. The race was cancelled after 1957 when two crashes killed 12 people, 5 of them were children. For many years the Mille Miglia existed only in memory as the legendary stories of these racing gods continued to be shared. However, in 1987 the Mille Miglia was reborn as a retrospective race, celebrating the glory days of the Mille Miglia but without the racing element. Cars drive to a set time, with the goal of arriving at the next checkpoint at precisely the right moment. The insane speeds have been reduced, giving competitors more time to enjoy the Tuscan sunshine; the lush agricultural land with terraced hillsides; and little white houses tiled in red. This, all accompanied by a symphony of Ferrari V12s and the howls of straight-six Jaguars on open exhausts piercing through the cacophony. Speak to anyone who has done the modern race and they become wistful-eyed and tell gushing stories of police escorts through crowded piazzas and of knowledgeable fans cheering as the cars blast over Florence’s famous Ponte Vecchio. The people who have taken part in this race have seen the very best Italy has to offer and come away with an appreciation for the true value of their cars, not just their price. Getting an entry to this prestigious event has become something of a black art. The Mille Miglia is the pinnacle of classic motoring events and has space for only 400 cars every year but is many-times over-subscribed. 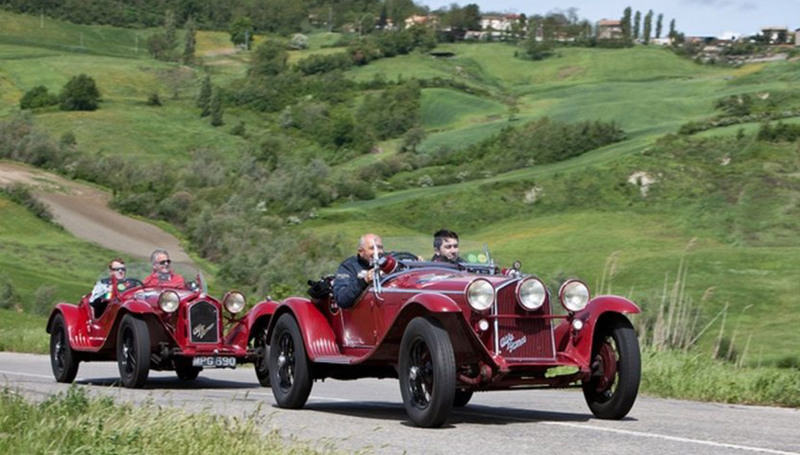 Mille Miglia eligible cars are those of which one model ran in the original 1927-57 race. Cars which actually took part in the race in period have a guaranteed entry (such as the Ferrari 225 currently in our care). However, there is a fair bit more smoke and mirrors to the organisers’ decision making process. A MM coefficient formula is applied to eligible cars to come up with a figure which determines how likely a car is to receive an entry. The calculation is as follows, with figures for period, class and category given a set value by the organisers: 1 + (Period of car + Class + Category) + (MM Factor – determined by the organisers) + MM Bonus (determined by the organisers). As you can see Mille Miglia Srl have plenty of discretion in this “scientific” formula to boost the likelihood of getting an entry. Submissions for the 2019 event opened just a few weeks ago on 23rd October and close on 10th January. This event is on the bucket list for everyone who shares a passion for motoring but people are often put off by the mistaken belief that only the most valuable cars are eligible. Have a look at the list of cars available now at The Classic Motor Hub and you will be surprised at how inexpensive the Mille Miglia can be. This particular car ran in the 1952 Mille Miglia and was driven by Count Sterzi in that year’s edition. As such this Ferrari is guaranteed an entry to the famous race. This care is cared for by The Classic Motor Hub and is currently being discreetly offered for sale to interested parties. The Bugatti Type 40 carries with it a very high MM coefficient of 1.75, making it very likely that an application will be accepted. The Type 40 ran in the MM between 1927 and 1929. This particular Bugatti Type 40 has just come in for sale at The Classic Motor Hub and previously competed at the Mille Miglia in 2017. All “Le Mans” series Aston Martins are eligible for the Mille Miglia. However impressive history will help make an application successful. In this regard, this Aston Martin LM3 currently for sale at The Classic Motor Hub is a ‘shoe-in’ having been raced by Augustus “Bert” Bertelli himself at a number of historic motor races. Aston Martin LM8 was a 1932 Le Mans works entry, and won the Rudge Cup in that year. LM8 is now offered for sale at The Classic Motor Hub, and with such impressive history it is hard to imagine the car would ever be declined a start time. The straight-six in this Jaguar Heritage Certified XK120 made it the fastest car in the world when launched in 1948 and as such was a formidable force on the Italian streets in the original Mille Miglia. This stunning example is currently offered for sale at The Classic Motor Hub with the option of a perfect private registration plate to go with it. For those that want a little more protection from the elements this recently-restored Jaguar XK120 Fixed Head Coupe offers the same performance as the roadster and may well be the sensible choice to tackle the gruelling event in. If you would like to see more about any of the mille miglia eligible cars featured here, visit our online showroom or pay us a visit.